Welcome to SouthCoastISP connection to PC Knowledge! In house PC Tune-up, spyware, Virus removal with firewall, anti virus program $9.99 a month. Now for lesson purposes only! 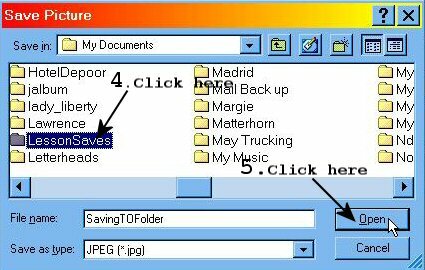 I want you to make a folder in My Documents called "LessonSaves"
We will save the below picture in that Folder. Important: Do this lesson in Internet explore The steps are the same in any browser, but the words might vary a little. 1. Right click on the picture below. 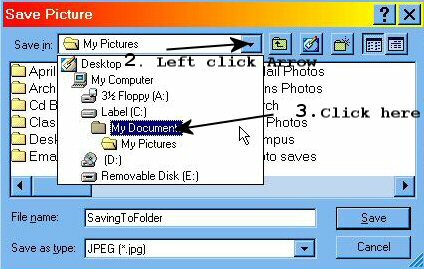 When the menu appears, do a left click on "Save Picture As"
The Below "Save Picture" dialog box will appear. The arrow below is hard to Teach. Once you learn the arrow you can go anywhere in your PC!! 4. 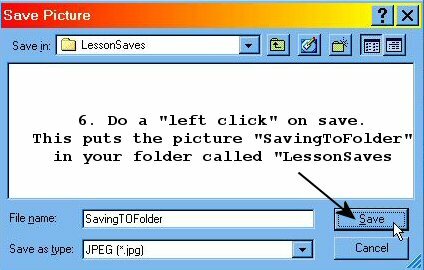 Select "LessonSaves" by a left click. 5. To open "LessonSaves" left click "Open"